Andrew has been working in television production in New York City for over 10 years. He's edited shows for national broadcast on PBS, Comedy Central, Bravo, E! Entertainment Television, The Style Network, Logo, Fuse, TMC, Court TV, Lifetime, and BET Networks. In 2010, Andrew received an Emmy Award for Outstanding Achievement in Single Camera Editing for his work on The Electric Company for PBS. Another project, Stories of the Innocence Project: Broken Words, which Andrew edited for Court TV, was awarded the CINE Golden Eagle Award. In addition to his work on A Cricket in the Court of Akbar, Andrew has produced and edited an independent documentary feature entitled Nerdcore Rising, which premiered to sold out houses at the SXSW Film Festival in March, 2008. The film chronicles the rise of Nerd rap and follows the first national tour of the movement's founder, MC Frontalot. Andrew also recently edited a short film called My Pantanal which aims to educate youth and local farmers about Jaguar conservation and sustainable farming in the Pantanal region of Brazil. 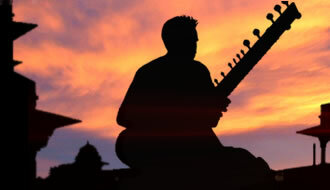 Andrew Mendelson is a devout student of Indian classical music and has been playing the sitar for 12 years. He has played at venues throughout the country and continues to perform at many New York City venues. He can be heard in the score for the recent Mike Myers film, The Love Guru, for which he composed the music for the opening credits. He is a disciple of renowned sitarist Pandit Krishna Mohan Bhatt. Negin earned her film chops as a producer and story editor on the film A Cricket in the Court of Akbar where she managed an 8 week shoot on location in Rajasthan, India. She also acted as a consultant and story developer for the documentary film Meeting David Wilson. Her short film Iran-ing on Empty, which she wrote, directed and appeared in, has been a selection in comedy festivals around the country, including the Chicago Comedy Festival and the New York City Sketch Festival. Negin has provided original comedy content for Pacifica and Sirius Radio stations and has written sketches for an Oxygen network series pilot. She has been an active comedian and producer for over ten years earning a nomination in the Emerging Comics of New York Awards. Her solo show, Bootleg Islam, which she wrote and performed, has appeared in the DC, Dallas, and Chicago Comedy Festivals. As a standup comedian she has opened for the likes of Al Franken and Bobby Lee (Mad TV). She has been seen in venues ranging from the Laugh Factory and Town Hall in New York to the Comedy Store and the Q Television Network in Los Angeles. Her work has been called “smart, funny, and fascinating” by the Wall Street Journal, a Critic’s Choice by the Chicago Tribune, “a shining exception,” by the Dallas Morning News, and Backstage cheered that it “doesn’t get much funnier than this!” Negin is a grant recipient from the Lower Manhattan Cultural Council. She also received a Columbia University Fellowship where she obtained a dual Masters degree from Columbia’s prestigious School of International & Public Affairs focusing her work on statistical analysis and city management. Nadia Abji has over 5 years of experience in youth documentaries, pro-social campaigns, political programming, music videos, promos and artist profiles. Nadia is currently working as a director and producer for MTV World. She recently directed a music video for UK pop-star, Raghav, that is now airing on MTV Desi and MTV India. Nadia has also produced for MTV News, MTV News and Documentaries, VH-1 and Kenneth Cole. Her show credits include: MTV's Choose or Lose Campaign, Fight For Your Rights Campaign, My Super Sweet 16, High School Stories: Scandals, Pranks and Controversies, and VH-1's Inside/Out: Fleetwood Mac. Nadia received the prestigious Peabody Award for her work on MTV's Fight for Your Rights Campaign and was also presented with the Joel A. Berger Award for outstanding broadcasting initiative. She holds a B.F.A. from NYU's Tisch School of the Arts in Dance with a double major in Broadcast Journalism and a minor in Art and Culture. When Nadia is not working she makes time to perform in New York City. Her dance credits include: Aretha Franklin, Umoja Dance Company and Nathan Trice/Rituals. Nichole is founder of DramaInk Pictures a writer-based production company, which seeks to partner with and empower the story-writer in film. She produced the company’s first feature, Trust & Devotion (trust-and-devotion.com) and is set to produce a film-adaptation of Andrew Cope’s The Revenge of Sonya this year. Nichole is also a writer and director and is currently developing her own original feature entitled Sweet Taste. In addition to her entrepreneurial pursuits and creative accomplishments, Nichole has a seasoned business background in production, accounting, sales, and as a booking agent for non-profit performance companies. Nichole also holds a B.F.A. from New York University’s Tisch School of the Arts. Michael Crain is a director of photography and Steadicam operator who specializes in a “big budget look” on a limited budget. He is a firm believer that limitations of budget and time can give birth to originality and creativity. His numerous credits include MTV, ABC, NBC, Fox, CNN, Disney, Nickelodeon, The History Channel, Discovery and Mark Burnett Productions. Michael began young – as a gaffer at 16. At 20 years of age he was a director of photography on the first of two feature films for New World Pictures. He also served as director of photography on a winner of the Best Film Award from the Academy of Science Fiction, Fantasy and Horror. It was also an official selection at the Avoriav Festival of the Fantastique. His work on the A&E Biography Series (including Michelangelo, Thomas Jefferson, George Washington, Cleopatra, and six others) won the Cable Ace Award for Best Documentary Series. Michelangelo has been the number one biography on Amazon.com. Among Michael’s many accolades, his documentary on the Blue Angels, a Disney project titled America’s Flying Aces, is the perennial number-one aviation documentary on Amazon.com. His music video, Cleopatra, Queen of Denial, received multiple nominations for Country Music Video of the Year. Michael has filmed in widely varying locations – from the Sistine Chapel, to castles in Transylvania, to the ice cap above the Arctic Circle. He shoots all camera formats from HD to DV and 16mm to 35mm. He is also a talented Steadicam owner/operator, with credits including Japan Airlines, Nickelodeon, MTV’s Cribs and The Apprentice. Michael’s work on a number of projects at sea, including re-creations for The Killer Storm (a documentary on The Perfect Storm story), and his work on ten episodes of Masters at Sea (for the History Channel), introduced him to his love of the sea. He lives on a 48-foot sailboat. Dan Woolsey was raised in Washington DC. He studied in Austria, Spain, and Italy before receiving a Bachelor’s Degree in Anthropology from The Colorado College. After working as a corporate investigator in London, he moved to New York to start a career in film. From humble beginnings as an intern and PA, Dan quickly pushed himself into the camera department of his first feature film. From there he climbed the ranks of the camera world from loader to 2nd AC to 1st AC, then operator and finally as a Director of Photography. As a specialist in all aspects of sound mixing and recording for film and video, Dan has applied his talents toward enhancing the audio for many productions. Dan also started lighting for film, but has learned that times and markets change and has lit for video extensively as well. He has done several projects on HD 24p – truly the threshold of the battle between film and video. A graduate of Georgetown University, Robin has been involved in theatre and the arts since high school. This led him to take a position with Magic Hour Productions, where he is involved in the production of the Dirty Dancing stage show, currently being performed in Australia, Germany and soon to open on the West End in London. Being Assistant Editor on A Cricket in the Court of Akbar is Robin’s first involvement in film and he is also Assistant Editor on the forthcoming documentary Nerdcore Rising. Robin has ambitions to use his science background in future documentary film projects.